One thing I always try to be? It can be a challenge at times, especially when life gets a little hectic and things get crazy at the Haus of Girls caring for seven kids during the day. There is lots of spilled milk and dirty diapers and it’s sometimes easy to get discouraged and overwhelmed. But I take a breath and I look around at all the JOY I have in my life. I am so thankful for what I do. Thankful for all I have. I feel everyone should take a moment to look around at all the JOY. Life is short. Too short to be negative and uninspired. I made these shirts for my girls to wear for our Christmas cards this year. I thought, what better way than to spread a little JOY to all of our family and friends through my girls’ laughter and love for life. I adore how the littlest things excite them. Bare feet on a cold concrete bench = total bliss from these three blondies. Take the time to teach your children the importance of spreading JOY in this, sometimes crazy and sometimes angry world that we live in. It’s amazing what a simple thank you, or compliment can do to someone’s spirits. Instead of only thinking it, actually take the time to say it. To your local mailman, gas station attendant, or librarian, to the CEO of a major corporation. Most people are just like you and I. Working hard to make ends meet, support their family, pay those overdue medical bills, and feed their children. Everyone deserves to be appreciated for what they are doing to make our world go round. A simple thank you can mean so much to so many. This is what I want to instill in my children. Spread some JOY today and tell me about it in my comments. I will pick one fabulous joy spreader to have their very own set of my JOY applique letters to put on your own cuties. I will select the winner next week! Also, I am guest posting over at Mommy Holly today and spreading a little Halloween Joy with my easy peasy Halloween Bunting tutorial. Please stop by and tell sweet Holly hello and enter to win one of my Polka Dot Pumpkin tees. Also, we're going to the river delta with a friend of mine and I made her pumpkin bread to say 'thank you' for going with the babies, dog and me because I can't take them safely out there by myself. And if I win the JOY applique? I'm putting one on each baby and one letter on the dog for the perfect Christmas card pic - LOL! 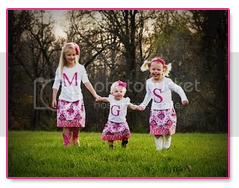 And, could your girls BE any cuter in those pics? LOVE IT! saying thank you is very important to me. Today I bought my littlest girl a small treat for her good report card and she said "Thank you Mommy" without being told. instant smile! I have been sick. All week. My babies have been sick. All week. BUT, I am so thankful and full of joy that I am fortunate enough to be a stay at home Mommy who homeschools and I never once had to factor in work or school to care for my lovelies. And, although being sick was no bueno, this week has been a joy to stop and focus only on my little's needs and be able to provide all that they needed. thanks for sharing your JOY. i would love a set of your appliques. How fitting that you would post something like this today...I have been stressing big time about my work situation and that I can't stay home with my lovelies just yet (maybe one day) but I delivered a cupcake order today to a little sick boy in the hospital at St. Johns and it really put it into perspective...for me not to sweat little piddly stuff and just be so thankful (joyous) that we are lucky enough to have healthy kids and family. I looked at the families in the rooms as I was leaving the pediatric floor and they all seemed to have a high spirit (wasn't even sure what brought them in there) but it made me really check my attitude. Thanks Mart for posting such a great post! Makes a perfect ending to such a great and reflective day! SOOOOOO cute Marta!!!! I am spreading LOTS of joy and love by forwarding your blog to EVERYONE I know :) And of course by my teaching too. I would LOVE some J O Y appliques!! I LOVE the shirts...love them..it brings me JOY! I'm spreading joy this weekend by treating a dear friend to a "girls night birthday dinner out" and I spread joy with my little's this morning by taking them on a long Fall walk and let them play in the leaves AS LONG AS THEY WANTED...which was quite a while! It's joyful to watch them though, how can you resist?? I am spreading Joy to my husband who is deployed with the military to Afghanistan for the next year. My children and I are sending an abundance of my husbands favorite goodies so he can share with other who do not have friends and family to send packages. We are spreading love, hope, and JOY to our military men and women serving afar! God bless them!!! Today joy spreading included home-baked goodies for friends, and big hugs and even bigger prayers for a friend in much need of JOY. Today...I am spreading joy by watching some friend's girls tonight so they can go to their older son's concert at school!